Charlie Edwards came out on top in the battle of Great Britain squad members when he defeated Jack Bateson at the England National Finals in Liverpool. 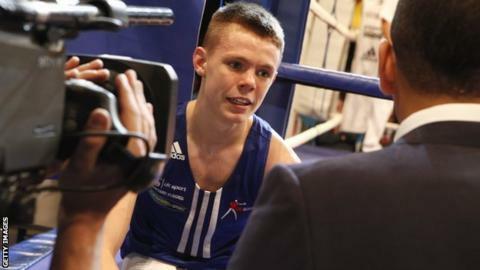 Top seed Edwards is in pole position for a Commonwealth Games spot in Glasgow this summer after his unanimous points decision in the 52kg category. Edwards, 21, said: "I showed everyone out there that I'm number one." World bronze medallist Antony Fowler had a unanimous points victory over Troy Williamson in the 75kg class. The Liverpool fighter, 23, delighted a home crowd at the Echo Arena to claim the best boxer award and a trophy dedicated to the memory of West Ham coach Micky May. Jack Bateson, Sam Maxwell and Joe Joyce share what it is like to deal with intensive training at the England Institute of Sport. Edwards and Bateson, 19, are friends on the Great Britain squad but have kept their distance since Leeds man Bateson moved up in weight to challenge Edwards' 52kg dominance. "There was definitely pressure on me because Jack was moving up and trying to take my spot, but I knew I had his number and I proved it to everyone out there," added Bateson, who is now certain to take the flyweight berth for England at the Commonwealth Games in July. Edwards edged the first round behind an accurate, rangy right-hand while the more composed Bateson pulled himself back into the bout in an action-packed second. In a strong finish by both men, Edwards was caught by a couple of Bateson right hands but did enough to hold on for a highly impressive victory. Birtley's Pat McCormack crowned his first senior year with the ABA 60kg title. The 19-year-old, who won the junior world and European titles in 2011, was too strong for Leeds-based opponent Jack Daniel. McCormack said: "I felt ready to step up to the seniors and I haven't felt much different. I am focused and determined to prove myself and get selected for the Commonwealth Games." In the 64kg division, 2011 champion Sam Maxwell beat fellow Great Britain squad member Josh Kelly on a unanimous points decision. A quality 10-fight programme came to an end when Joe Joyce beat top seed Frazer Clarke on a TKO in the over 91kg category. Every English member of the GB boxing squad entered the tournament and 17 made it through to the final stages at the Echo Arena.